COLOMBO: The 6th World Carrom Championship was held at the Galadari Hotel, Colombo Srilanka from 31st October – 4th November. 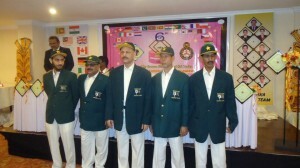 During the Championship 7 events were organized by the Srilankan Carrom Federation including the Swiss League. A total of 18 countries participated in the Championship making it by far the biggest Carrom event in the history of Carrom. In the main event of the Championship i-e the Men’s and Women’s Singles Event, Nishantha Fernando of Srilanka made history by snatching the crown from India defeating Bhartidasan of India in two straight games of 25-4 and 25-10. Fernando was on fire from the beginning of the match and outclassed his Indian opponent with his aggressive game. Earlier Fernando had to beat K. Shrinivas of India by 25-18 and 25-23 to secure his spot in the final. Moreover, he beat P. Gaikwad of India in the Quarter Finals by 25-23 and 25-5. Bhartidasan of India stood second and Yogesh Pardesi of India stood 3rd in the event. A total of 18 countries participated in the main event of the Championship. On the other hand, during the Women’s Singles Event, Rashmi Kumari of India also made history by securing the title for the 2nd time. She is the only women’s player to have achieved this in the history of Carrom. Rashmi Kumari beat her teammate Illavazhaki of India by 25-12 and 25-11 to secure her 1st title. Earlier she beat K. Somanchi of India by 25-2 and 25-18 during the semi finals and Yashika Rahudabba of Srilanka by 25-4 and 25-6 during the semi finals. However, the India contingent managed to secure the top three spot with Kumari at first, I. Illavazhaki, and K. Somanchi on 2nd and 3rd place respectively. In the Men’s Doubles event K. Srinivas and Bhartidasan of India were beaten by fellow countrymen Yogesh Pardeshi and Paraksh Gaikwad who secure the 1st place by 22-25, 25-nil and 25-15. Nishantha Fernando and Chamil Coorey of Srilanka secured the 3rd position by beating M. Sherifdeen/Dimal Senaratne of Srilanka by 25-0 and 25-08. In the Women’s Doubles event, I.Illavazhaki and Rashmi Kumari of India beat Madhuhika Kanchanamala and Yashika Rahubadda of Srilanka by 25-05 and 25-07 to secure the first position. Whereas, Roshita Joshep and Chalani Lakmali of Srilanka beat Kavitha Somanchi and Parimala Devi of India by 7-25, 25-8 and 25-22 to secure the third spot. A total of 16 teams participated in the team’s event including, Pakistan, India, Bangladesh, Srilanka, Maldives, UK, USA, Canada, Poland, Italy, Qatar, Switzerland, Germany, Malaysia, Korea and Japan. The Pakistani contingent comprised of Murtaza Khan Zulfee (Captain), Ramzan Ali (Player), Muhammad Suleman (Player), Muhammad Shafiq (Player) and Saad Bin Murtaza (Manager). In the Men’s Team event India stood 1st, Srilanka 2nd and Bangladesh secured the 3rd spot. Whereas, in the Women’s Team event India stood 1st again, Srilanka 2nd however Maldives stood 3rd due to the absence of Bangladeshi Women’s team. Bangladeshi Women’s team could not make it to the Championship due to financial crisis along with the 5th World Carrom Championship host France who were unable to participate in the tournament due to financial crisis as well. The Swiss League was also conducted successfully during the Championship by Shreenivas Mallisetti of USA and Elisa Zucchiatti of Italy. It is the second time that the Swiss League has been a part of the World Carrom Championship. It was also played at Cannes France during 5th World Carrom Championship.